Ever since the illegal planned invasion and destruction of Iraq admitted by General Wesley Clark in his "7 countries in 5 years" debriefing to the American people in 2007 and outlined in the globalist Project for a New American Century (PNAC) plans from BEFORE 9/11, Iraq has been at the center of the new world order. How could they not? It was Iraq's Saddam Hussein who was a master patsy FOR the United States who armed Hussein to the tune of billions of dollars only to pull the carpet underneath his feet when they saw that he wasn't going to play (petro dollar) ball with them any more. Iraq is also the birth place of ISIS (al Qaeda in Iraq at the time). But ISIS only really took a stronghold in Iraq after the planned and engineered fall of Iraq at the hands of the U.S. So it shouldn't surprise anyone that the June 2014 planned and staged ISIS takeover of Mosul in Iraq to help build the new world order in a post Saddam era is now blowing up in the faces of the globalist terrorist who orchestrated this event which they prefer to call the "fall of Mosul". Okay, I agree it "fell" alright, but not the way they make it sound. In this planned takeover of Mosul some measly 500 or so ISIS fighters somehow defeated over 30 thousand armed and trained Iraqi fighters by having the fighters simply not fight back as they were told to do by commanding generals above them. Something entirely unheard of in modern day warfare and something that must force even the most naive people to scratch their heads wondering how this could be. A year later, Iraqi officials are now closely probing the roles numerous Iraqi generals and officials including former prime minister Nouri al-Maliki had in the June 2014 fall of Mosul at the hand of ISIS. None of this is new to the people of Iraq as news networks had reported the admitted "conspiracy" back in November of 2014. 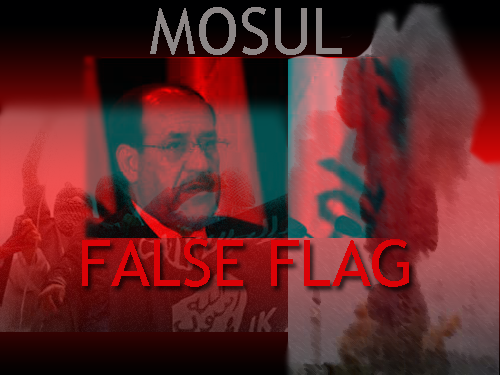 Iraqi officials are calling for the arrest of all the players involved in this planned false flag ISIS takeover of Mosul. This is equivalent to state officials calling for the arrest of those who did 9/11 here in the U.S.. Unfortunately, as with any story that hurts ISIS, we can probably expect quiet, direct and indirect massive support for ISIS coming from the west in the coming weeks in the form of terrorism and murders throughout Iraq in response to this probe. Unfortunately, this is the true front-line battle against the new world order that most Americans have no idea is happening and that Iraqi officials are all too familiar with by now. Additionally, the probe is not limited to the fall of Mosul but also the equally suspicious and even more improbable fall of Ramadi which was attributed to a mysterious "sandstorm" which blew in just in perfect timing to allow ISIS to defeat the Ramadi armies with ease. As with the staged fall of Mosul, the fall of Ramadi was surrounded by very suspicious behavior on the part of the military leaders who again offered little to no resistance, a high crime which is all now being probed very carefully. As the legal probing continues with these massive false flags and as the PNAC plans continue moving forward another thing to watch is the position taken by U.S. officials as countries like Iraq are slowly dismantled. U.S. officials, for example, were very casual about the fall of Ramadi when it happened, as if to say "oh well", claiming it was nothing more than a "set back" against ISIS, without probing very seriously into how the city fell to ISIS. Furthermore when Ramadi fell we saw top CIA asset and globalist TV characters like Colonel Anthony Shaffer go on Fox News referring to the Iraqi army as being futile, and useless and how the Kurds are the real army. Shaffer skillfully pushes the PNAC plans in real-time and in everyone's face without most people realizing why he is saying what he is saying. The point is to make the government and thus the standing Army of Iraq, who is NOT loyal to the new world order plans seem as if they are irrelevant, and to make the much more controllable and more importantly indistinguishable "Kurds" seem like the true power of the sword in Iraq. All of this is a psyop to push the planned breakup of Iraq. Welcome to the PNAC plans and welcome to the ISIS psyop! You may wonder; how can any of this be true? What planned breakup of Iraq? How can the U.S. support ISIS in Iraq? Sounds crazy? Actually, anyone who does their own research can read U.S. government documents that clearly outlined the goal for Iraq prior to the destruction of Iraq and prior to the creation of ISIS. The goal clearly stated was to break up Iraq into sectarian regions run by sectarian forces which is exactly the role ISIS is fulfilling to perfection in line with the PNAC plans for the Middle East. As if that's not enough, government documents admit specifically Mosul and Ramadi would be the key cities to bring down to facilitate this plan! Coincidence?? Maybe that explains why ISIS will freely (apparently) travel all around the world injecting themselves into every facet of life, yet mysteriously they never consider attacking supposed arch enemy Israel who is a few miles down the road comparatively. The world sees this. No one is being fooled any more. And that may explain why Iraqi officials have now proven to be a major problem for the PNAC plan Zionist/Western designers and new world order network of pro terrorism assets like ISIS. To admire the timeline of this ISIS plan let's fast rewind to June of 2014. This is when CIA's U.S. mainstream media had already been working on the ISIS show, slowly building it up to believable capacity. The average person in June of 2014 felt that after George W Bush's "by any means necessary" war on terror, Patriot Act, Guantanamo, torture, and multiple decade long "wars" against those supposed bogeymen that lived in caves, that the "terrorists" finally lost. No one felt that the U.S. "lost" the war on terror, the feeling was that in order to justify the funding ($$) for the CONTINUED war on terror that it must be working. Wasn't that the point after all? A successful war on terror is after all the narrative used to justify the budgets for illegal NSA spying, TSA, DHS and so on. Why would anyone continue funding a failed effort of any kind whether it's a product, a program or a war plan? In some ways this is where (arguably) the ISIS psyop begins, at least in the minds of the American people. Consider that up to this point ISIS was mostly an unknown group of masked men who supposedly had a lot of money and would later spin off fancy fake beheading videos that only Rita Katz of SITE Institute could grab and post on the web BEFORE ISIS could do it. These fake beheading videos were specifically targeted at Christians in an attempt to get them to support war and funding ($$$) against ISIS the new "bad guys" in town. Here we are over a year later and the ISIS story in itself has proven to be an indestructible beast which plows forward regardless of how many times its exposed. Like the official story of 9/11. You can't get any newer evidence to add to the 1000 mile long list of overwhelming evidence, yet the "official story" rolls on. The majority of normal intelligence people get it that these government "official stories" are lies and yet the official story of ISIS, like the 9/11 official story deflects bullets like the Terminator and continues right along as if nothing got in its way. In the way of the ISIS psyop, obstructing its plan is a constant flow of obstacles like the President of Sudan exposing that ISIS is a product of CIA and Mossad. Like top Iranian commanders exposing that ISIS is supported by U.S. and Israel. Like former commanders of Al Qaeda admitting ISIS is under the control of the CIA. And like numerous Iraqi officials repeatedly exposing the ISIS-CIA-Mossad connection, in some cases with video proof. The investigative independent media has surely had plenty of verifiable documentations of West's creation, funding, arming and current support of the Islamic State or ISIS. So as this new chapter of justice attempts to unfold in Iraq it is very important to understand the history of this battle to understand the possible outcome. For everyone not under the spell of mainstream media this one is a good story to follow. Will Iraqi officials prevail in exposing these new world order false flags driving a nail in the coffin of the ISIS psyop or will the forces of Western propaganda prevail again by ignoring or undermining the story? Will they pull off another false flag to make everyone forget about the end result of this one? This is after all what they usually do. Consider this. How many people still remember what the major narratives were before the ISIS show took over the airwaves in September of 2014? The biggest story was Israeli war crimes in Palestine. Everyone was discussing whether Israel should be charged with war crimes but does anyone still remember this? To a lesser degree another highly covered narrative was the Ferguson Missouri shootings which at one point pulled too much attention to the police state in America. None of this was good for business if you're the globalist controllers. The point is pay attention to how narratives are abruptly changed when things are not going well for the globalist. And since they control both the mainstream media and the upcoming narratives, it is easy for them to set up the next narrative with an event which the media suddenly pays attention to 24/7. That event is then used to make you forget the last narrative. So if these probes into the falls of Mosul and Ramadi at the hands of ISIS ever gain any traction be extremely vigilant for their next move especially given that this involves a highly coveted country in the crosshairs of the new world order since day one. One thing for sure, truth seekers, independent journalists and investigators more than ever will have their hands full tracking the moves of the new world order in what has now become a very dangerous world.